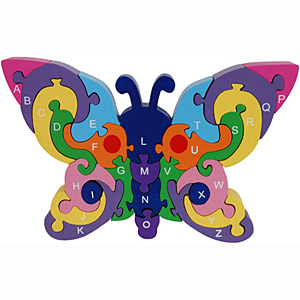 ImagiPLAY Alphabet Butterfly Puzzle - Made of plantation grown, chemical free rubberwood, this colorful puzzle teaches kids letters while they configure a beautiful, hand-painted butterfly. 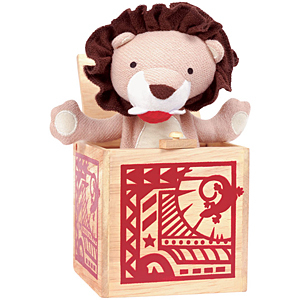 Pop-Up Lion - The lion is made of 100% certified organic cotton, and the box is made of naturally sustainable rubberwood. 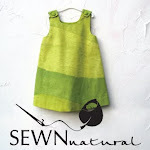 I love this eco spin on a jack-in-the-box. 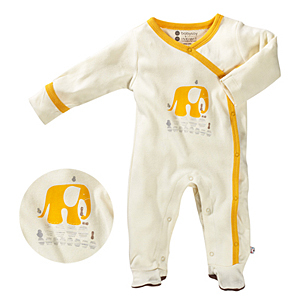 This sweet little elephant footie is comprised of 50% organic cotton and 50% soybean fiber, and printed with water-based ink. Kimono style snaps make for easy diaper changes.